The Horn of Africa Regional Environment Center and Network (HoA-REC&N) is an autonomous institution under Addis Ababa University. HoA-REC&N focuses on environmental concerns and sustainable development options within the Horn of Africa. Partner institutions include University of Hohenheim; University of Massachusetts–Boston; and the Oromia Coffee Farmers Cooperative Union. Coffee accounts for 60 percent of the export earnings in Ethiopia, and is processed by dry and wet processing. Wet processed is preferred in the global market. Unfortunately, farmers do not see the full benefit of their coffee production. 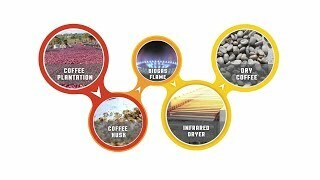 A significant portion of coffee harvested is of inferior quality due to the traditional sun drying process. This process can take up to twelve days and increases exposure of coffee to fungi and other undesirable elements. Thermal drying is energy intensive and takes up a large amount of space. The proposed solution uses biogas digestion of coffee husk and pulp waste to fuel state-of-the-art coffee driers to reduce coffee cherry drying time from several days to hours. Reduced drying time minimizes the post-harvest loss that occurs when using the conventional sun drying process. Biogas generated from coffee pulp and coffee husk will be used to power the bioreactors used for infrared drying. The success of this project will lead to new opportunities that can transform the current traditional coffee production system while improving the quantity and quality of coffee by decreasing exposure of coffee to fungi and other undesirable elements. By reducing the time farmers spend in coffee processing, the time saved can be used for other productive uses which will help them generate additional income. The project will also improve work conditions for women and children, who are primarily responsible for the sun drying process which requires all-day exposure to the sun. HoA-REC&N found that neither biodigesters designed for coffee feedstock nor biogas-powered driers are commercially available. In preparation for future efforts to design and prototype these two technologies, HoA-REC&N is assessing the commercial need and feedstock availability. This will include evaluating project partner coffee husk and pulp waste production. With this data, HoA will be able to calculate biogas production rates and demonstrate theoretical technical feasibility. HoA also plans to conduct customer discovery and market research to show that there is commercial need for biogas-powered driers. HoA will also use the information collected from potential customers to create an initial business model for a biogas-powered drier installation company. It is hoped that the technical feasibility, customer and market research, and an initial business plan will serve as the foundation of any subsequent efforts to design, build, and field test a biogas-powered coffee cherry drier. Horn of Africa Regional Environment Center and Network discusses how their project will improve coffee production and quality using infrared technology in Ethiopia. This project has been selected for a 2015 Powering Agriculture Award.